Cyril enlisted on 18th October 1915. He was 19 years old, a Grocers Assistant by trade, and living at 41 Wellington Street, Kettering at the time. 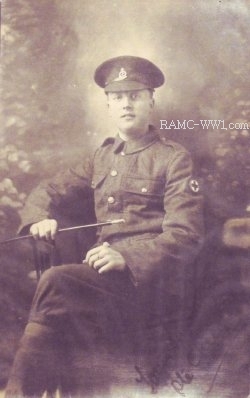 He served at home until 10th April 1916, doing his training at the RAMC Training Centre, Eastbourne, when he embarked at Southampton for Rouen to join the British Expeditionary Force. On 22nd April, as part of a party of ten reinforcements allocated to the A.D.M.S. of the 32nd Division, he was proceeding up country to join the 92nd Field Ambulance when he fell off the train at Abberville. Witness statements confirm that the train had stopped and Cyril was stepping off to have a wash when he accidently tripped and fell forward. He was assisted by a nurse, then put on a stretcher and later admitted into No 2 Stationary Hospital with a fractured humeris on his right shoulder. He was transferred to the UK on the 6th May and remained in hospital from the 8th May - 17th June 1916. On the 6th August Cyril joined the Hospital Ship "Cambria", he served on the ship until 17th December 1917 when he was transferred to join a Rest Camp in Southampton. On 5th August 1918 he rejoined H.M.H.S "Cambria" and served there until the end of the war. He returned to the U.K. on 23rd May 1919 and was transferred to Class "Z" on 19th June. Cyril married in 1920 at Kettering [Woods] and died in 1979 at Colchester. He was the son of Elizabeth Keech.